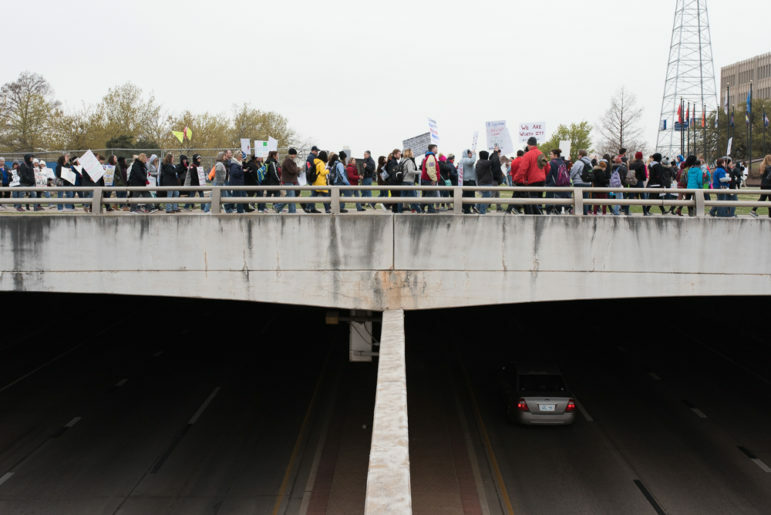 Teachers, students and supporters march around the state Capitol and across the 23rd Street overpass on April 2 during a walkout aimed at increasing education funding. Boosting teacher pay by an average of $6,000—which the Legislature approved last week—wasn’t enough to put the brakes on a massive shutdown of schools to rally at the state Capitol. An estimated 30,000 people attended Monday’s rally, and many school districts were closed again Tuesday and Wednesday so the walkout can continue. But could the pay package, which passed by a narrow margin in the generally tax-averse legislature, turn the tide on the state’s teacher shortage? The problems facing teachers and the teaching profession are myriad, but, like so many things in state government, they boil down to money – how much there is for teachers, support staff and for schools in general. Alarm bells about the state’s struggle to staff classrooms with qualified teachers have been sounding for years. There are now more than 1,900 emergency certified teachers in Oklahoma classrooms — a 67 percent increase from last year. There were fewer than 100 five years ago. Emergency-certified teachers hold a bachelor’s degree but lack classroom experience. Yet school administrators say the lack of applicants forces them to hire nontraditional teachers. One in five schools operate on a four-day week, a strategy that stretches the budget a little but mostly gives schools an edge in recruiting teachers. Oklahoma is losing teachers to other professions and other states. The consequences of that include electives and advanced courses that are cut because schools can’t find anyone to teach them, and rising class sizes. Julie Caruso, a science teacher at Rogers Middle School in Oklahoma City who rallied at the Capitol Monday, said her students need elective courses restored and reading specialists brought back. Without those supports, students are falling behind. “That’s what makes my job the most difficult. That’s where I start thinking I don’t get paid enough for this: the heartache for the extra work … trying to make up for those deficits,” she said. Teachers are fleeing Oklahoma for many reasons, with pay being the most common, said Theresa Cullen, an associate professor at the University of Oklahoma. In October, she published the results of a survey of 250 teachers who began their careers in Oklahoma but were teaching in other states. More than 80 percent said they left for money. Average teacher compensation in Oklahoma is $45,276 including benefits, according to the National Education Association. That ranks Oklahoma 48th, after Mississippi and South Dakota. New teachers are eligible to retire when they hit the “rule of 90,” or their age plus years of service. The top five consecutive years of salary determines the size of a retiree’s pension. The higher teacher pay schedule isn’t expected to have much effect on the Teacher Retirement System, where current retirees have average pensions of between $22,000 and $23,000 a year. That’s because the higher pay will also mean higher contributions, on a dollar basis, for both employees and their employers. Currently, employees pay 7 percent of their compensation into the retirement system, while their employers pay 9.5 percent. The legislation approved last Thursday will give raises that average about $6,000. The raises start at $5,000 for new teachers and increase with experience. Jason Perez, chief human resources officer for Mid-Del Public Schools, said even after the raises go into effect, pay will be an issue when competing with Texas districts. At a recent job fair, his district was in a booth next to recruiters for Mesquite, a Dallas suburb. Their salaries were a full $20,000 higher for teachers with no experience. Next time, Mid-Del will still be offering about $15,000 less, assuming Mesquite’s salaries don’t increase. Perez said if the Legislature continues to increase teacher salaries a little each year, Oklahoma could become competitive. But if they expect the $6,000 boost to tide teachers over for another 10 years, it won’t be long before the state is back in the same spot. “We’re going to hang onto some of the teachers that would have been on the fence about retiring or resigning, but I doubt this is going to do a whole lot to really change teacher recruitment,” Perez said. Other reasons for leaving cited by teachers in Cullen’s research are not as easily addressed through legislation. More than 50 percent of teachers cited “respect” as a factor for leaving the state, and just under 50 percent said “political climate”. Raising the starting pay will help get brand new teachers into the school, Cullen said. But if legislators don’t fix the long-term funding, it won’t keep teachers there. There is evidence the pay increase could draw teachers back into the classroom. In Cullen’s survey, a third of the teachers said they were likely or very likely to return to Oklahoma if the education system improved. A separate survey of more than 5,000 Oklahomans with active teaching certificates but who weren’t teaching also found a third of teachers would return to the classroom if salaries improved. Emma Sawyer, a student majoring in education at the University of Central Oklahoma, was among those rallying at the Capitol Monday. She said she’s hopeful the walkout will result in a positive outcome for future teachers like herself, and future students in classrooms around the state. “It’s dim right now. I’m really hoping that today changes that future for me, so I’m not forced to leave the state,” Sawyer said. Contributing: Whitney Bryen and Paul Monies.